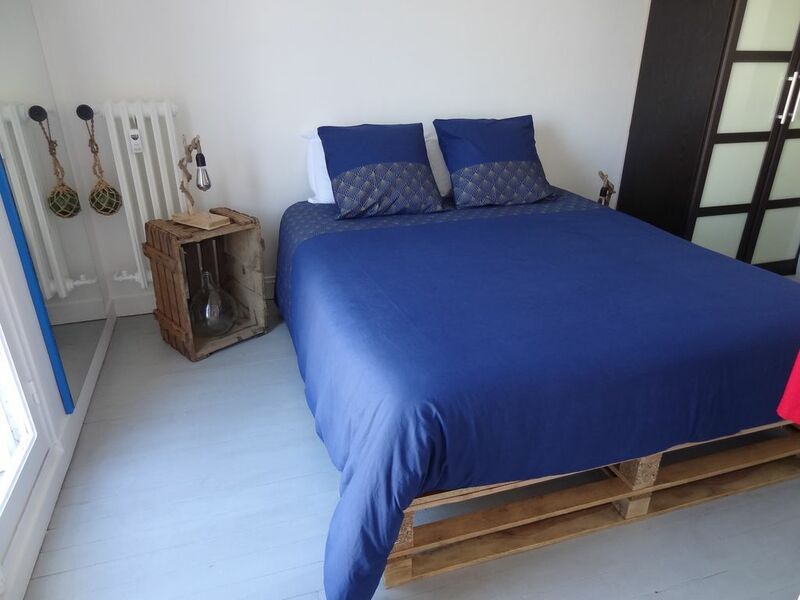 Located in the heart of the Perrey district (UNESCO World Heritage), this authentic PERRET apartment of 44sqm is located close to the MuMa (André Malraux Museum), the fishing port, marina and 10 minutes walk from the beach. FREE PARKING. BED LINEN, bath and beach SUPPLIED. A living room with a lounge with a sofa bed for two people (Mattresses Dunlopillo), with a TV (123 cm) and WiFi. The kitchen has a mini-oven, a microwave, a fridge, a kettle, a filter coffee maker, a juicer, a toaster and various basic products such as salt, pepper, sugar, oil, vinegar, tea (Coffea) and coffee (Carte Noire). A set of 8 plates flat, hollow and dessert are also available with cutlery and water glasses, wine, beer, champagne, coffee cups, and mugs (liquid-dish supplied). This apartment also has a bedroom with a bed for two people with a box spring and a 160x200 mattress brand new. A set of duvet covers, duvet and pillows are also available in the wardrobe and wardrobe of this room. It is equipped with a mobile fan. The bathroom has a shower, washbasin, a washing machine of 9kg (pods provided) and a 9kg tumble dryer (Electrolux), and storage for towels (provided) and your personal effects. The shampoo (Dove) and the handwash liquid are also provided. A beach bag containing 4 beach towels is also available for travelers. For young children it is equipped with a cot, a high chair, a child bath and various toys. The apartment is on the 3rd floor of the building, there is no lift. There is no access for people with reduced mobility. I will be there for the delivery of keys and I will be delighted to discuss with you the different places to visit the city of Le Havre and its surroundings. For arrivals: 15:00 - 22:00 possibility to extend arrival times if possible. From the train and bus station as well as the airport Octeville it is possible to pick you up on arrival for € 5. Otherwise there is the tram for € 1.70 per ticket, get off at the city hall and then it takes a little more than 10 minutes walk to the apartment.